The Staunton River is located in south-central Virginia and forms the boundaries of Campbell, Pittsyvania, Halifax and Charlotte counties. Actually an 81-mile segment of the Roanoke River, the Staunton River begins at Leesville Dam and continues to the confluence with John H. Kerr Reservoir. Bird watchers, anglers, and hunters will enjoy the bounty of the river and its adjacent bottomlands. Canoeists can experience the challenging Fish Trap (Class III) and Cat Rock (Class II) rapids. In addition, an abundance of flat water is available for those individuals seeking a more relaxing trip down the river. Large sections of the Staunton River also are accessible to motorboats. The bottomlands bordering the river are largely undeveloped and are under ownership of individuals, paper companies, or municipalities. River users should control litter and seek landowner permission prior to camping or picnicking on the river banks. Common courtesy is requested of river users. Leesville Landing is located at the end of Route 754 US 29 near Motley in Pittsylvania County. Access is provided to Leesville Reservoir at the dam. However, no access is available to the dam tailwater area. Fishery resources include year-round angling for walleye, striped bass, white bass, largemouth bass, various catfish species, and Roanoke bass (a larger cousin of the rock bass). Be aware of widely fluctuating water levels, abundant logs and other floating debris in the lake. Boaters are urged to dress appropriately for the weather and carry emergency supplies. 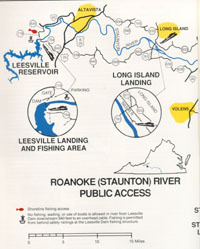 The Leesville Fishing Area is located on the north side of the river below Leesville dam and is reached by taking Route 630 from HW 43 and following to the end of Route 718. The Leesville Fishing Area provides access for bank fishing only within the tailwater of Leesville Dam. Fishing is restricted to the walkway behind safety railings. No wade fishing or boat and canoe launching is permitted. Fishing opportunities include seasonal spawning runs of walleye, striped bass, and white bass. Some walleye apparently hold in the tailwater year-round. Catfish, including larger flathead catfish, can be caught in the tailwater pool from the spring through fall. Anglers are advised to adhere to all rules as posted at the parking area. Rapidly rising water levels require special attention. Respond to all warning sirens by moving to higher ground until water levels stabilize. This upper-most float covers 19.8 miles and is too much river for a one-day excursion. Plan on camping but make sure you have landowner permission before doing so. Launch at the English Park boat ramp in the town of Altavista off Route 668, reached by taking Business 29/Main Street through town. Take out at the DGIF Long Island boat ramp off Route 761. This ramp provides access for canoes and motorboats. Riffles both above and below the Altavista ramp limit motorboat access. Fishery resources include walleye, suckers, and catfish. This stretch is also the best section of the Staunton River to catch smallmouth bass, rock bass and Roanoke bass due to abundant rocky habitat and riffle stretches. This trip covers 11 miles of the designated state scenic river segment of Staunton River. The scenic river designation now covers 51.3 miles and stretches all the way to the Route 360 bridge. Launch on north side of river at the DGIF Long Island ramp off Route 761, reached by taking Route 633 approximately 1.5 miles north of Brookneal on US 501. Take out at DGIF ramp located off US 501 at Brookneal. This ramp provides access for canoes and motorboats. Riffles both above and below the Long Island ramp limit motorboats to 1.5 miles of navigable rivers. Fishery resources include seasonal runs of walleye, striped bass, white bass, and suckers. Catfish can be found in deeper holes. Smallmouth bass and Roanoke bass are common in this section, particularly around riffles and other rocky habitat. This stretch of river includes difficult rapids (Classes II and III) that should not be attempted by novice canoeists. NOTE: As of April 2018, Clarkton Bridge Boat Landing, located just off Rt. 620 (Clarkton Bridge Road), in Halifax County has been permanently closed to public access. Boaters are encouraged to use the DGIF Boat Landing located off US 501 at Brookneal or the Watkins Bridge Boat Landing on Rt. 746 north of Clover. This trip is the shortest of the Staunton River floats and totals 6.6 miles. Launch at the DGIF ramp located off US 501 at Brookneal and take out at the DGIF ramp at Clarkton bridge off Route 620. From the Brookneal ramp, motorboats have nearly 38 miles of navigable river available. Flat water with a mild current during normal summer flows make for pleasant canoeing. Seasonal spawning runs of walleye and striped bass can be expected on this stretch of the river. Channel and flathead catfish are common in this stretch. Spotted, largemouth and smallmouth bass are also caught in this portion of the Staunton. At 22 miles, this is a particularly long float for canoes and should be planned as an overnight trip. Of course, landowner permission must be obtained prior to camping on private land along the river. Launch at DGIF ramp located off Route 620 at Clarkton bridge and take out at Watkins Bridge (Rt. 746) north of Clover. Seasonal spawning runs of walleye, striped bass, and suckers can be expected in this stretch. Flathead catfish and other catfish species are common as well. Kentucky spotted bass and Roanoke bass are occasionally caught by anglers. Sandbars alternately protrude into the channel and could be a hazard to motorboat operators. Boaters should pack emergency supplies when boating on this section of the Staunton River in the event of capsizing. Launch from DGIF ramp at Watkins Bridge (Rt. 746) north of Clover. Take out at DGIF ramp adjacent to US 360 E.
Access is provided for canoes and motorboats. Nearly 38 miles of navigable river are available for motorboats. Mellow current at normal summer flows can be expected. Seasonal spawning runs of walleye, striped bass, white bass, and suckers pass through this stretch. Various catfish species occur here and occasional catches of Kentucky spotted bass and Roanoke bass are reported. Boaters should be cautious of alternately situated sandbars and a minor riffle located downstream from the HW 92 bridge. This section of the Staunton River should be planned as an overnight trip for canoeists. Landowner permission must be obtained prior to camping on private land along with river. Launch from DGIF ramp off US 360E. Take out at Staunton River State Park ramp at the end of HW 344 off US 360. The river is accessible to both canoes and motorboats. Thirteen navigable miles of river are available. Slow, flat water characterizes this stretch. Up to 4.5 miles of still water must be crossed where the river meets the lake to reach the state park ramp. Seasonal fishing for migrating walleye, suckers, striped bass, and white bass occurs here. Catfish, gar, largemouth bass, and crappie also offer angling action. Waterfowl, wading birds, and raptors (osprey and bald eagles) are abundant amongst the many islands at the confluence with the lake. Sandbars and sand shoals are potential navigation hazards to motorboat operators. Boaters may become disoriented by the multiple channels at the river delta. Launch at Staunton River State Park ramp at the end of HW 344 off US 360. 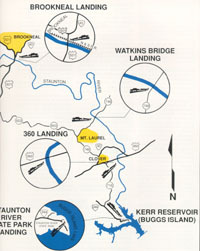 Access for canoes and motorboats is provided to John H. Kerr Reservoir and the Staunton River delta. Spawning runs of walleye, suckers, striped bass, and white bass pass through this area seasonally. Catfish, largemouth bass, and crappie are attractive angling prospects. Bow hunting for carp and gar is productive in the river delta. Strong, easterly winds can generate hazardous wave conditions for boaters. Braided channels within the river delta can be disorienting. Sand shoals are abundant upstream of the ramp and may be a navigational hazard to motorboat operators. Please see the Float Trips and Maps section, located under “Maps”. Please contact the VDGIF Forest office.